This wasn’t necessarily true even a year ago, but consumer habits have changed. It’s a story we’re hearing more often. A business adds Zipwhip texting to a landline or toll free number and receives a sudden flood of messages from customers that have been trying, and failing, to contact it. Why are so many people shifting to text? Why now? Is this a fad or a long-term trend, and what do businesses need to know? We surveyed over 1,500 consumers from across the United States in search of answers. Here’s what we found. Phone Calls Are Inconvenient – Some people prefer voice calls, but many others prefer to text. Supporting phone calls and text messages on the same number gives you the best chance to connect with all your customers. Voicemail Is Dead – Consumers rarely respond to voicemails, especially when the number isn’t saved in their address book. One in four consumers won’t even listen to a voicemail if they don’t recognize the caller. Your mobile phone rings, but you don’t recognize the number. How do you respond? If you’re like most of the people Zipwhip surveyed, you let it keep ringing. A full 84% of consumers say they won’t answer calls from numbers they don’t recognize. As a business, your phone number probably isn’t saved in your customers’ mobile address books. That’s why so many of your calls go straight to voicemail. Don’t Be Annoying – Your customers mute incoming calls because they don’t have time in the middle of the workday to stop what they’re doing and speak with you. Even a “quick five minute call” can last for 20 minutes or more. When Zipwhip asked consumers to describe how they feel when businesses call them, 76% of respondents chose negative terms like annoyed or inconvenienced. These negative feelings spill over to the person or company placing the call, hurting your brand perception. Annoyed customers are less likely to buy what you’re selling, if you even get through to them. Text messages offer a welcome alternative to annoying phone calls. Some of your customers still want to call, but all of them will appreciate having a choice. Supporting Customer Choices – When a call comes in, your customer has four choices: mute, message, decline, or answer. When they don’t recognize the caller, only 16% of consumers choose to answer. Although few answer the call, nearly half of consumers have chosen to text back to an incoming call instead of answering. You’re significantly more likely to get a response if you support both options. Choosing Text Over Voice Calls – Text messaging used to be viewed as a personal communication channel, but that view has changed. More consumers are choosing to text with businesses like they do with friends and family. A 2015 Nuance survey found that 1 in 5 consumers would rather text with a business than speak to one on the phone.2 Zipwhip’s survey, performed only one year later, found nearly 2 in 5 people would prefer to text, a 100% increase! Consumers that don’t answer or reply to your phone calls might still be solid leads and engaged customers, you’re just reaching out to them the wrong way. If a customer ignores your phone call, and most will, you have few options. Leaving a voicemail is a bad one. Listening to a voicemail takes time that busy people don’t have. When a missed call comes from a friend, family member, or colleague, a name appears in the missed call log. The recipient can respond without actually listening to the message. When a missed call comes from an unknown number, the recipient can respond blindly, listen to the message, or ignore it. Nearly a quarter of consumers simply ignore it, refusing to listen to voicemails left by unknown callers. Even when they do listen to the voicemail, very few consumers will respond if they don’t know the caller. Of the few who do respond to voicemails from unknown callers, half will send a text message but won’t call back. Only 3% of all voicemails from unknown callers will get a call back. 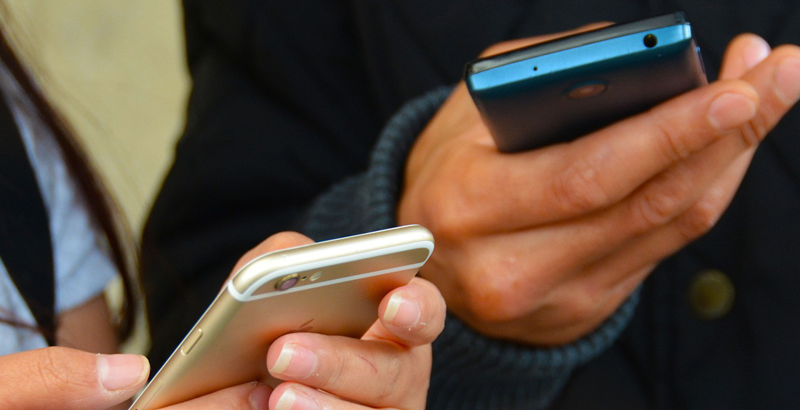 More Convenient For Customers – If you don’t connect on the first try, sending a text is your best shot at getting a response from your customer. If a customer receives a voicemail and a text message from two unknown numbers, they are seven times more likely to respond to the text. Text messages deliver better results because they’re convenient. Your customer can see at a glance who is texting and what you want them to know. They can respond on their own time. The fact that you support text says something about your brand. Sending a text signals that you respect your customers’ time and gives your customers a chance to control the conversation. More Transparent For Business – Text messages also give you, the business, more insight into whether your message goes through and it is received. The first outbound phone call that you make to a customer is likely a formality. You ask “is this a convenient time to talk?” and take the conversation from there. It is time-consuming to reach out to a customer just to schedule another phone call. A text message is more efficient for simple tasks like scheduling. Plus, with a reputable texting platform, businesses get a delivery receipt as soon as a text message reaches the customer. You’re never left guessing whether your message made it through. Texting is even more popular with the Millennial generation, adults between the ages of 18 and 34. Millennials represent the largest age group in the U.S. workforce, and their influence and buying power continue to grow. As Millennials gain influence, their preferences will shape the future of communications. Millennials’ top priorities are control and convenience, and text messaging delivers both. Offering Millennials a positive experience means supporting text. Given the choice, most Millennials would rather text with a business than call. Most, 61%, think businesses should call and text them from the same number. Millennials are four times more likely to text back to a text than call back to a voicemail. When they do respond to voicemails, they’re four times more likely than the average consumer to send a text back instead of calling. Millennials are driving the current surge in text traffic, and businesses would do well to take notice. A Trend, Not A Fad – Text traffic between mobile and landline networks has grown steadily over the past eight years. Lately, that growth has accelerated. Text traffic to toll free numbers alone grew 300% last year, and so far 2016 is already breaking records. Business texting today appears to be where email was in 1995. It’s an essential, near-universal communication platform. Consumers are fed up with poor voice calling experiences like waiting on hold and receiving unwanted robocalls. They crave the control and convenience that text delivers. Most consumers agree that businesses should accept text messages on the same number they use for voice calls, their existing phone number. If your business has a phone number, some of your customers are texting it. If you don’t support text on that number, you’re ignoring those customers. Until recently, text messaging gave you a competitive advantage, but it wasn’t essential. As a business, you could get by without it and rely on the “necessary evil” of voice calls and voicemails. That’s no longer true. If you don’t support texting today, you’re out of touch with your customers. Do all of your customers prefer text? No, probably not. However, a significant number do, and it’s bad business to ignore them. The results from our consumer survey offered three explanations for why text is taking off now and why growth will likely continue. Control: Your customers lead crazy, busy lives, and they crave control wherever they can get it. Calls are annoying because they must be answered in the moment. Calls interrupt previously scheduled activities. Giving your customers a choice between calling and texting puts control back in their hands. When they can choose how to contact you and when, they’re more likely to actually follow through. Convenience: Because they’re so busy, your customers are constantly multitasking. They flip between tabs, screens, and devices. Voicemail is inconvenient because it breaks the multitasking flow and takes over an entire screen. As a result, many customers ignore voicemails and few respond to them. Your customers would rather see, at a glance, who is contacting them and why. Text messages offer that convenience. Sending a text is the most effective way to leave a message that your customer will actually read and reply to. Millenial demographic: Preferences for control and convenience are amplified among Millennials. The younger your customers are, the more they want to text with you. As older generations retire, they’re being replaced by Millennials. These young adults exert influence as consumers and as business buyers. Looking at the demographics of who is texting and why, it makes sense that text traffic continues to grow year over year. Consumers are fed up with poor voice calling experiences like waiting on hold and receiving unwanted robocalls. They crave the control and convenience that text delivers. Michael Shrage. “Time to Hang Up on V” Harvard Business Review, September 30, 2013. “Text Messaging–The Channel that Gets Attention.” White Paper, 2015.